Illuminated Backlit Trade Show Displays - The Best Solution for Trade Shows. 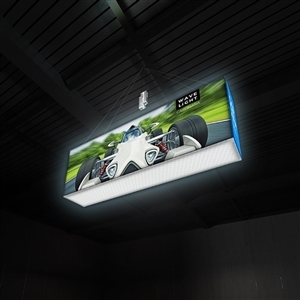 Backlit Displays include energy efficient lightbox graphic illuminations, engineered LED lighting technology, seamless SEG fabric mural graphics and user-friendly modular display hardware. Standard backlit lightbox display kit sizes include 10' x 10' displays, 10' x 20' booths, 20' x 20' island exhibits, small tabletops, portable counters and double-sided free-standing lightbox sign towers. Backlit Trade Show Displays feature ultra-portable LED lightbox frames in standard kit sizes or integrated into custom exhibit booths. Backlit Displays include energy efficient lightbox graphic illuminations, using engineered LED lighting technology, seamless SEG fabric mural graphics and user-friendly modular display hardware. 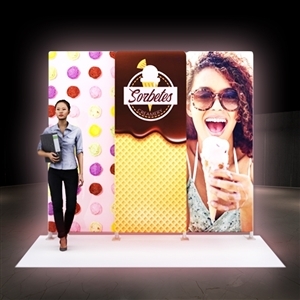 Backlit trade show displays are often exhibited in corner booth spaces and can easily be integrated into any existing trade show booth layout. 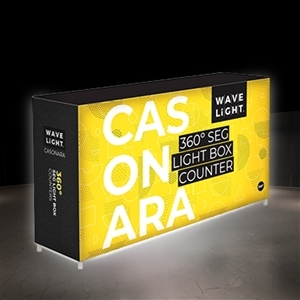 Our large online selection of brand-name portable trade show displays include the largest selection of backlit displays, LED lightbox signage kits, and "next generation" LED trade show lighting technology you'll find in the USA. 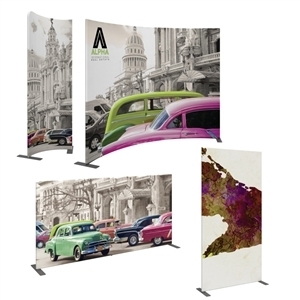 Whether you are looking for a way to draw attention and captivate your audience at a tradeshow, special event, or in a permanent environment, these tension fabric Backlit Trade Show Displays are designed to impress. Different frame configurations for a stunning 3-dimensional display. The Tension Fabric Backlit Trade Show Display is the ultimate in frame-graphic technology! Create a stunning 3-dimensional display in a SNAP! Different frame configurations offer you a playground to create dramatic effects with endless design possibilities! Backlit Trade Show Displays draw attention and captivate your audience in any setting. Easily create and define a stunning focal point at your next event with Illuminated Trade Show Exhibits. 3-D capability and fabric size options create a truly unique display and lasting impression. The versatility of this frame allows you to change graphics easily to create a totally fresh backlit tower display. The next generation in large graphic presentations. These new light weight heavy duty frames can suspend a fabric graphic image. Erected in seconds and packed away just as quickly, this display is the newest solution for the busy exhibitor to display and be on the move! The Tension Fabric Graphic Illuminated Trade Show Display offers a large format graphic area to get you noticed at your events! The aluminum frame structure breaks down into simple pieces for shipping in a small cases. High quality dye sub fabric graphics fit over the frame "pillow case" style creating a large format backlit graphic image to attract attention at your events, but keeping this display lightweight and simple to set up. Trade Show Illuminated Displays can be used effectively as both stand alone displays or as a complement to other trade show displays. Our Backlit Illuminated displays provide an excellent way to show large scale backlit graphics in a small amount of space with crowd stopping presence. Trade Show Backlit Displays offer a unique shape. 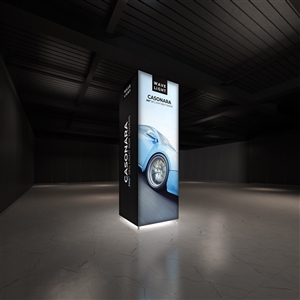 Elegant differently shaped illuminated promotional graphic system. This cost effective, backlit banner displays features a sturdy construction and stylish design. Backlighting Frame kits are available to turn your trade show hanging sign into a lightbox.